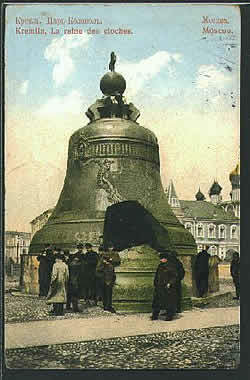 Russia's famous Tsar-Kolokol is the largest bell in the world, of course, but it is broken. Apart from that, if you inspect our list of bells larger than 1,000 puds (36,000 lbs, or about 18 metric tons or more), you'll probably be surprised to see that the world's biggest working bells are not in Russia, but in Burma, Korea, and Japan. Another is under water, but there has lately been some talk of trying to locate and raise it. Yet another was lost in World War II. 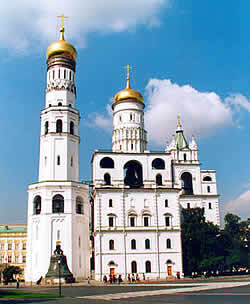 Only then, sixth or seventh down the list, do we find Trinity-Sergius Lavra's "Tsarsky Kolokol", or "Royal Bell". Burmese chronicles relate that King Dhammazedi, 9th of the Mon kings of Burma (now known as Myanmar), who reigned at Hanthawaddy (Bago) from 1464 onward, had ordered a census of households in his kingdom sometime around the year 1480. However, his over-zealous ministers not only counted the households; they also taxed them thus obtaining some 180,000 vis (293.4 metric, or about 600 US tons) of copper. King Dhammazedi was not pleased and so, to allay his wrath, the ministers proposed to have the copper cast into a bell. That was how the biggest bell in history came to be. The chronicles also note that the date chosen for the casting of the Bell, 5 February 1484, was astrologically inappropriate and that the Bell had an unpleasant sound. A century later, in 1583, Venetian gem merchant named Gasparo Balbi visited ancient Dagon and described the Shwedagon Pagoda at length. He wrote, "I found in a fair hall a very large bell which we measured, and found to be seven paces and three hand breadths and it is full of letters from the top to the bottom, so near together that one touches the other, but there was no Nation that could understand them." By 1530 the Mon kings were in decline and in 1535 Lower Burma had become subject to Upper Burma. At the same time, European traders and adventurers had begun to make contacts in Lower Burma. So in the 1590s, with the authority of the rulers in Upper Burma, a Portuguese adventurer, Filipe de Brito y Nicote, set up a new trading post at Syriam and by 1600 had extended his power across the river to Dagon and the surrounding countryside. Thus in 1608 De Brito removed the Dhammazedi bell from the Shwedagon Paaoda, rolled it down the hill to a raft in the Pazundaung Creek and had it hauled by elephants to the river. The the bell and raft were lashed to his flagship for the journey across the river to Thanlyn (Syrian) to be melted down and made into ships cannons. However, at the confluence of the Bago and Yangon Rivers off what is now known as Monkey Point, the raft broke up and the bell went to the bottom, taking Filipe de Brito's ship with it justly, we think. The Portugeuse suffered for their bungled looting, too their entire garrison was killed in an attack by angry Burmese, and records suggest the Portuguese leader died a slow death on bamboo stakes. All accounts of the history of Rangoon insist that Dhammazedi's bell was never recovered and until the late 1800's the top of it could still be seen above water at low tide. Some witnesses today tell of being rowed out to the bell site by their elders to watch the water eddy over the top of the submerged bell. The river isn't especially deep, (40 feet), but at the bottom there is 40 feet more of mud. The bell is somewhere in the mud. A smaller bell, known as the Bodawpaya, was also taken from the Shwedagon Pagoda by British Prize Agents in 1826 and lost in the river. However, it was abandoned by the British and recovered by the local inhabitants and returned to the pagoda. There are other great bells on view on the Shwedagon, but they are much later than Balbi"s time. 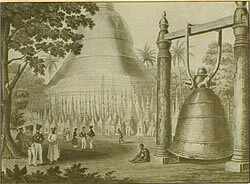 King Singu, had a 24.6 metric (50 US)-ton bronze bell, 2.1 m high and 2.0 m wide at the mouth, cast and offered to the Shwedagon on 17 January 1779. Known as the Mahagandha Bell, it can be found today on the northwest side of the main pagoda platform. The British pillaged the pagoda during their 1824 to 1826 wartime occupation and tried to carry the bell to Calcutta, but fell victim to the same fate as de Brito: this bell, too, sank into the river. The British failed in several attempts to raise it. The Myanmars said they would raise the bell on the condition it would be returned to its original resting place in the pagoda, and the British, thinking nothing would come out of the attempt, agreed. But the Myanmars had an ingenious plan. Divers tied countless bamboo poles underneath the bell and floated it to the surface. The undertaking helped to instill the Myanmars with nationalism during the years of British occupation. 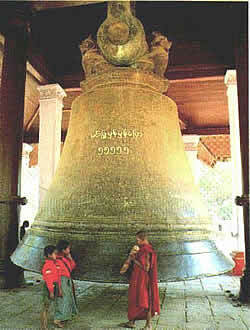 The other bell, 42.5 metric (85 US) tons in weight, 4.3 m high and 2.2 m wide at the mouth, was cast and donated by King Tharrawaddy on 19 February 1843. 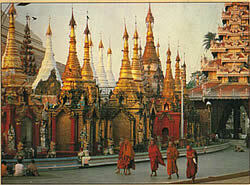 It is known as the Mahatissada and is located at the northeast corner of the pagoda enclosure. Dhammazedi's Bell To Be Recovered? The Burmese government has asked an English marine biologist / archaeologist / adventurer (you know the type) named Mike Hatcher and his team to raise the bell; they want to see it restored to the Pagoda. Hatcher has agreed to undertake the project, which has involvement from Japanese, Australian and American companies. Richard Gere, a committed and active supporter of Buddhist ideals, is involved in raising funds. The project would undoubtedly inspire curiosity at an international level. The German film company which will be shooting the expedition says, "Should the salvage operation succeed, the reaction in the Buddhist world would be comparable to finding the Holy Grail in the Christian West." One of Burma's most sacred religious relics, it is believed that its restoration in the pagoda will bring good fortune back to Myanmar. Certainly, recovery of King Dhammazedi"s Bell the offering of a devout king and his people to one of Myanmar"s most sacred shrines would restore a lost heritage to the Myanmar people. In more ways than one, in fact´ for the bell"s inscription would provide valuable material for historical and linguistic scholarship. The project is not without its opponents: Some pro-democracy campaigners say the salvage operation might be misconstrued as an endorsement by the international community of Myanmar's military dictatorship, and should wait until talks with the regime have progressed or until such time as a democratic government is in place. One of seven salvage projects forecast for Mike Hatcher and his team in 2001, Mike's team was slated to begin the search for the precise location of the Dhammazedi Bell in March that year. After a flurry of excitement stirred up by BBC's announcement of the project, however, it apparently did not get off the ground, perhaps (we speculate) due to complications involved in his discovery in June 2000 of a huge sunken wreck in Indonesian waters, with the largest collection of porcelain ever found. If the project ever does go forward, divers will use personal mounted sonar with night vision goggles and copper sulphate detectors to locate the bell, since the mud around all that bronze would have a high concentration of copper sulphate. About nine months after the survey they expect to lift the Bell from the river. To do this, they will have to build a small version of a North Sea Oil platform in the muddy rapids of the confluence of two rivers, and assemble a large crane to lift the bell out of the water. Once it is lifted, they will construct a railway to transport it uphill about half a mile to the Shwedagon Pagoda. This final operation will take about four months. King Dhammazedi's bell may or may not be lost forever, but even if it is, the world's largest accessible and ringing bell is still not in Russia. 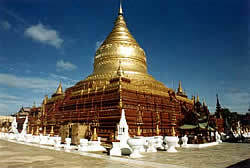 That title is owned by Burma's Mingun Bell, which rings near the city of Sagaing, at the Mingun pagoda, some 11 km (7 miles) upriver from Mandalay, in the center of Burma, on the opposite bank of the Ayeyarwaddy and accessible only by river. A 45-minute boat trip to Mingun is very pleasant with plenty of life on the river to see. The pagoda itself was the main jewel in the crown of an ambitious building campaign sponsored by King Bodawpaya (ruled 1782-1819). The largest brick temple in Asia, its outline broods over the western bank of the Irrawaddy River from the hamlet of Mingun. Its base is 256 feet square and it rises some 150 feet. It is now viewed as little more than a curiosity, enhanced by dramatic fissures in its wall created by an earthquake in 1839-- visitors can even climb to the top by a modern stairway mounted on the most ruined corner fo the monument, though no access to the summit existed originally. The Mingun is Asia's, and indeed, the world's, largest bell. Cast by Bodawpaya to complemlent the huge pagoda, it stands in its original location some 50 yeards to the northeast of the pagoda. The pagoda is still considered unfinished, since it is without a tower, but historians believe King Bodawpaya may have intended to sacrifice height for girth from the very beginning, and thus it may have been considered finished by the king himself. Pagodas were built to venerate sacred objects interred beneath them-- in fact, the word "pagoda" derives from *dagaba* (relic chamber), a term adopted into English after it was encountered in Buddhist Sri Lanka. 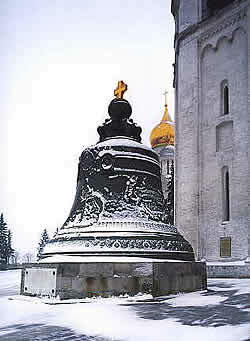 The world's largest bell is the Tsar Bell III (Tsar-Kolokol) in Moscow. It is called Tsar Kolokol "III" because it was cast three times, and more metal was added each time. The present incarnation was cast in 1733-35, and weighs about 400,000 pounds (180 tons). Resting at the foot of the Ivan Velekij Bell Tower, the bell is a mute testimony to the grand days of the Romanov Dynasty and to the weakness of all human endeavor. Tsarina Anna I commissioned the bell in 1734, fulfilling the dream of her grandfather, Tsar Alexei. At 6.14 meters high and 6.6 meters in diameter, it was to be the biggest and clearest sounding bell in the world. The casting of this enormous bell was performed by a team of nearly 200 craftsmen under the supervision of Ivan Motorin and his son Mikhail, who cast many of Russia's other great bells. Their crowning achievement was destined only for tragedy, however. During the great fire of 1737 it still lay in its casting pit, and burning timber from the structure above it fell into the pit. Bronze has a relatively low melting point, so the question was whether to let it burn and risk melting it, or to pour water on it and risk cracking it by cooling it too fast. The latter risk was chosen and, as feared, because of uneven cooling, the red-hot bronze did crack and a chunk weighing 11.5 tons broke off. This chunk alone weighs more than most bells in the world. 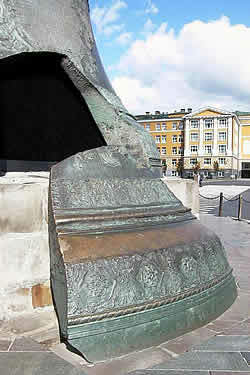 The broken Tsar Bell remained in the earth for almost 100 more years after that, until the architect Auguste Montferrand raised it in 1836 and placed it on its present granite pedestal. The surface of the bell is finely worked in relief with decorative patterns, embossed pictures, and inscriptions. Sadly, two hundred tons of silence are all that remain. For a time, the bell served as a chapel. There has apparently been some talk of recasting it. Some Old Believers are of the opinion that this would be a bad sign, as this bell is slated to ring Blagovest on Judgment Day! Cannons and bells have always had a curious relationship bells are melted down to make cannons in times of war, and cannons are melted town to make bells in times of peace. So we ought to mention that just outside the Kremlin's Cathedral Square where the Tsar-Kolokol sits, you also find the stunningly huge cannon pictured at the right. 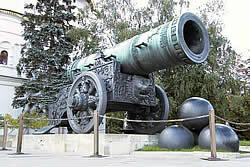 The Tsar Cannon, built in 1586, is considered the largest cannon in the world, sixteen feet long, weighing 85,000 pounds, with a caliber of 890 mm. Tsar Theodore I, Ivan the Terrible's son, commissioned master bronze craftsman Andrei Chekov to cast the giant bronze weapon to better protect the Kremlin. 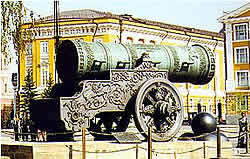 The Tsar Cannon is thus quite a bit older than the Tsar Bell. The gun carriage and the cannon balls lying nearby are decorative, for the cannon itself was designed to fire not cannon balls but grapeshot. However, in actuality, it proved to be impractical to use.